TweetDeck is one of the most widely used Twitter apps around the world as it integrates several social media services and makes updating and sharing easier. It was a shame that it wasn’t available for Android based phones till now but it has finally arrived. All Android users can head over to www.tweetdeck.com/api/android_whitelist/ and sign up for a Tweetdeck account. Once done, you’ll receive an email with instructions and a link to download Tweetdeck onto your Android device. TweetDeck for Android integrates Facebook, Twitter, Foursquare and Buzz accounts in to a single application with colour coded updates appearing in a single blended column. There’s also a new “Me” column which pulls together all messages that mention you from across multiple streams, including Twitter @replies, Facebook likes and comments, and Buzz updates on your posts. When you compose a message, you can pick which service you want to send it out on from the same screen. The application is big on location based services and hence makes great use of the Foursquare API acting as a full Foursquare client. You can check into a location, leave a shout or a tip, or see a location on a map. Each location has a detail view which shows you all your friends who checked in there recently and any messages they left. A general map view shows all nearby Foursquare venues and any geotagged Tweets. Friends who have checked in nearby are also placed on the map. The app has a contacts page with quick links to each of your account profiles, and slots for the people you talk to the most. 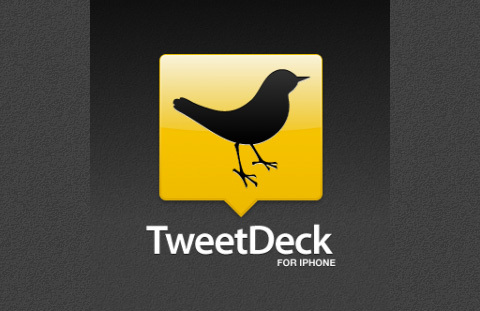 This is one up on the iPhone version of Tweetdeck which doesn’t yet support Foursquare and Buzz. Android based TweetDeck promises to bring improved map performance, better handling for multiple Twitter accounts, video upload capabilities and better integration with Android hardware in the near future.